With traditional publishers struggling and the rise of social media where "everyones a publisher", brands need to think about how they themselves become publishers in their field/market, of useful,engaging, personalised content delivered through social and online channels. This session describes the conversation marketing technology now becoming available to orchestrate and automate this process and how customers interaction with that content in turn ties back to provide insight and inform the more traditional marketing campaigns to the customer. Bob has been marketing in the technology industry for 25 years, working for brands such as Oracle, NCR and SAS. 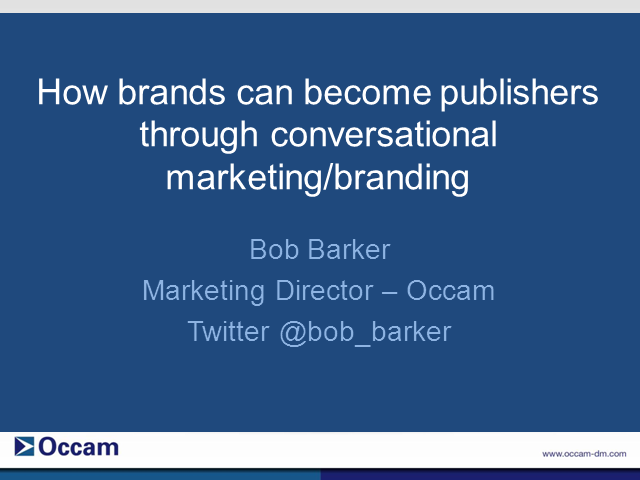 For the past 3 years, Bob has run the Corporate Marketing and Digital Engagement at Alterian and is now CMO of Occam, the market-leading provider of marketing management software.